“Highly recommended for women's studies, education, and general reference collections. ... Approximately 500 publications, mostly published from 1976 to 1983 and mostly books and articles, are provided with full information and annotated. Awareness of them may help achieve gender balance within the curriculum because they address the issues of bias and exclusion of females within the traditional disciplines (sexism), evaluate or apply emerging feminist research methods and theoretical perspectives, and present strategies designed to integrate women, their contributions, and experiences within the curriculum. Upper-division undergraduate and graduate collections." 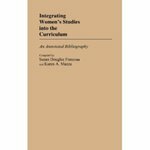 Franzosa, Susan D. & Karen A. Mazza Integrating Women's Studies into the Curriculum: An Annotated Bibliography, Westport, CT: Greenwood Press, 1984. Franzosa, Susan D. and Mazza, Karen A., "Integrating Women's Studies into the Curriculum: An Annotated Bibliography" (1984). GSEAP Faculty Book and Media Gallery. 3.